Chiffon skirts are my go to fashion pieces when it comes to beating the heat in style. But more than often I order chiffon skirts online and when I receive them am hugely disappointed. As the material is nothing like chiffon, it's just a cheap imitation which just kills the look of the skirt. I am pleasantly surprised this was not the case with Doe Designs. 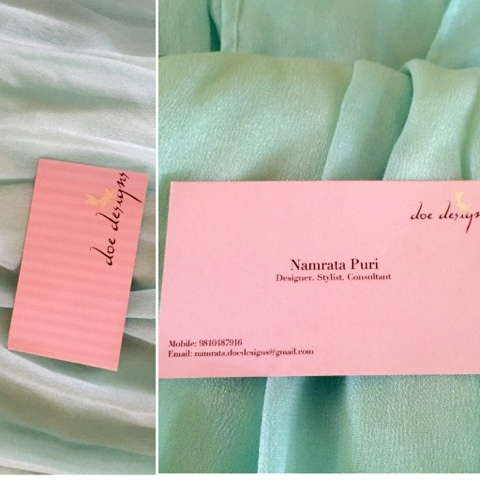 Doe designs is fashion boutique store based in Delhi owned and designed by gorgeous Namarata Puri. While collaborating I spoke to her and she said she personally looks into each of her designs to create unique pieces. For her quality matters the most than quantity. I could totally see what she meant when I received this pastel blue chiffon skirt. It's a long length chiffon skirt with high slits from both sides. I like the small pleats at the waist line which gives the skirt an edgy look. Do check Doe designs Facebook page or email her for any design enquiry. I have styled the beautiful chiffon skirts in 3 different ways. 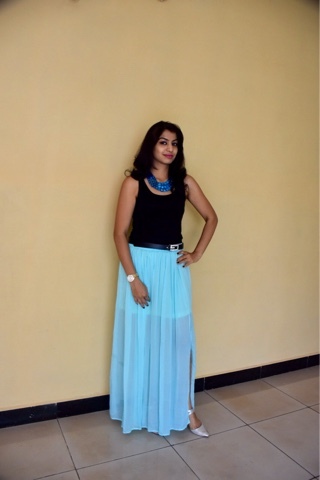 Yes this simple chiffon skirt is such a versatile piece. For this post I thank my model friend Amrutha Raibagi for sporting these different looks. Let me know which one you like the most. Lovely skirt. I like it the most with the printed top :) It's stylish!